In the Main Menu, click Setup, Program Links. Double-click on Tscan from www.tekscan.com. Tscan is digital imaging software. Website: www.tekscan.com. Patient ID is the key link between OD and Tscan. The Tscan program requires the patient ID to be composed of letters and numbers only. 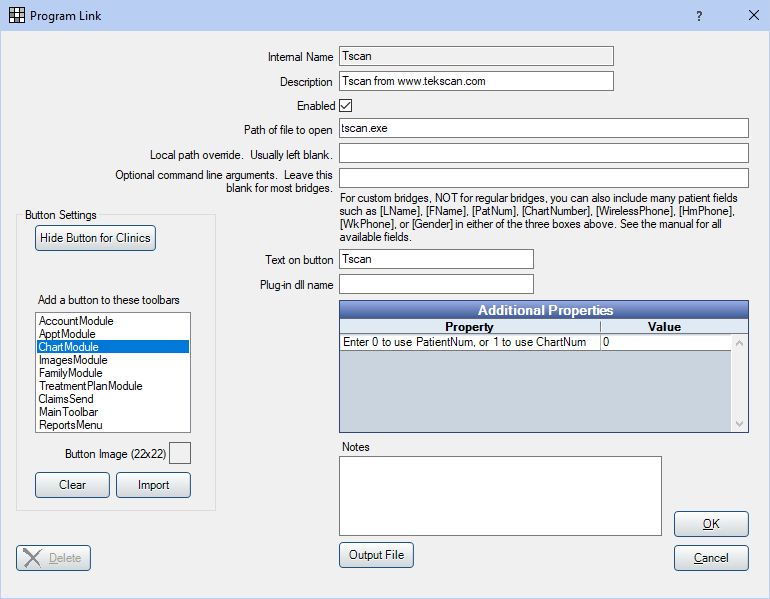 If the Enter 0 to use PatientNum, or 1 to use ChartNum property is set to 1, then any characters that are not letters or numbers will be removed before the bridge is invoked. When the bridge is invoked, Tscan performs a case-insensitive search to locate the existing patient. If a patient ID match is found for an existing patient within the Tscan database, then the found patient is selected in Tscan. If the patient ID is not found, then a new patient is created in Tscan. If Tscan finds the same patient ID and there is discrepancy between first, last or middle names, then a warning message is displayed. Additionally, the bridge always sends the patient first and last name to Tscan and removes any characters which are not letters or numbers. If a patient middle name has been entered, then the bridge sends the patient middle name and removes any characters which are not letters or numbers. If the patient has a birthdate entered in OD, then the birthdate is sent over to Tscan, otherwise no birthdate is sent. If the patient gender is set to male or female, then the gender information will be sent to Tscan. Otherwise, if the patient gender is set to unknown then the gender is not sent to Tscan.